Check out this awesome Easter Egg inside Chrome for Mac. When your browser cant reach the internet you get an error message in your tab. Awhile ago Chrome started using a pixel art dinosaur icon as part of that error message. 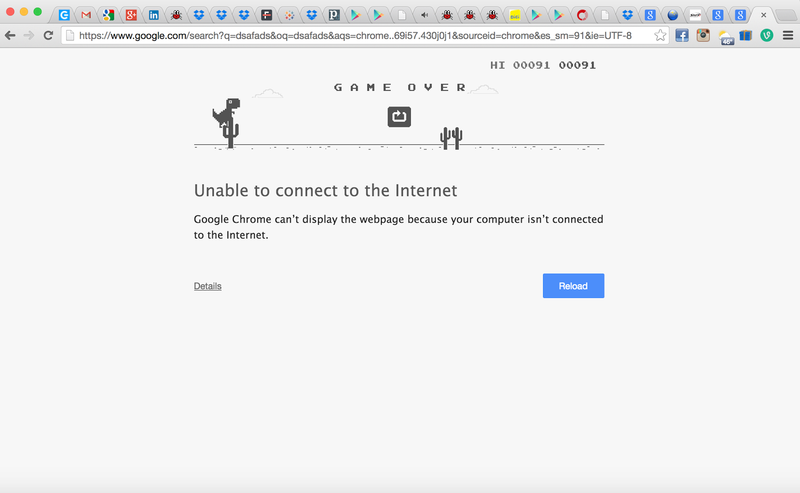 Now, if you hit [SPACE BAR] while in a "can not connect to internet" tab inside Chrome on OS X the dinosaur will jump and start running. There is an old school style game inside the chrome tab !!! Its like flappy bird. There is one button for jump, and the whole goal is to keep the dinosaur running by jumping over the cactus obstacles. Given information was very excellent & Great tips, and awesome way to get exert tips from everyone,not only i like that post all peoples like that post,because of all given information was wonderful and it's very helpful for me.